Doctor Storm is an experienced general practitioner with broad knowledge of general practice preventative medicine and family healthcare. We are dedicated to providing excellent medical care and we especially value our relationship with our patients as integral to good thorough medical care. A well equipped procedure room is available for minor procedures under local anaesthetic e.g. suturing of lacerations and treatment of skin lesions (excision, electro cauterization and cryocauterization). We are able to do routine annual medical tests like stress-ECG and computer- based lungfunctions and required tests for insurance medical examinations with ECG equipment. Doctor Storm has a broad knowledge of children's illnesses and he has a keen interest in the treatment of allergies. 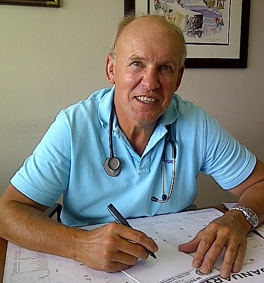 Dr Willie Storm has been practicing medicine for 25 years in South Africa and has a well equipped procedure room for minor procedures, as well as PC-based lungfunctions and stress-ECG test.